Chances are where you live hunting is a highly regulated pastime. It has to be to keep nature’s critical balance in check because animals are such an important aspect of that. But like anything there are always exceptions to that rule and one of those exceptions is usually the hunting at nighttime of what are considered to be feral animals; these are pest animals that are found in such large numbers that they intrude on people’s lives on a constant basis and the natural ecosystem lacks other predators that consume them. The problem with most of these animals is they are active only at night so you will need a good pair of night vision goggles or other night vision product to make hunting them much easier. Why this is a good night vision product? This is a night vision product that is built sturdy and produces a high quality image when you are viewing objects with it after dark. Best of all it is a very affordable night vision device too. That means it is a great entry level product for those of you that are just being introduced to the fascinating world of predator hunting after dark. It comes with everything you need right in the package and that includes 2 AA batteries, a protective case and a carrying strap. In just a few short minutes you can have the Firefield 5×50 Nightfall Monocular ready to use. This monocular night vision device uses infrared illumination to alert you to the fact that there is game present in your area. It will not only alert you to an animal’s presence but it will create an image that can help you identify that animal before you go to shoot too. It also features 12mm eye relief technology, long looking 5X magnification and a 50mm lens for a generous field of view and some good image resolution. With this combination you can spot animals clearly as far as 3000 feet away. So if you want to enhance your night hunting experience at an affordable price, then this monocular night vision product from Firefield would be an excellent choice for you. While many hand held night vision devices are compact, lightweight and easy to use they still do not give you all the advantages that a wearable night vision product will give you. Having your hands free when scouting for game at night can certainly be a big advantage for you. That is why I feel this Armasight night vision goggle is a great buy for the price. This Armasight night vision product offers you such features as a long battery life, adjustable fit and the convenience of being able to flip the imaging goggle in and out of place. It is a product you can wear for hours without feeling burdened and you can be ready in an instant to spot and identify any feral animal that appears in front of you. The quality of the first generation infrared technology you get with this device is extremely good. It can help you easily search and spot for game to shoot in the area you are hunting. Wearable goggles can even make your trek in and out of the places you hunt at night much easier. 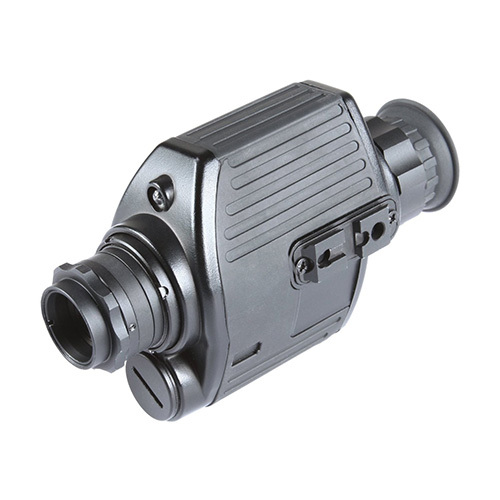 Combined with its other features such as all 100% coated glass optics and a generous 35 degree field of view, this is a night vision device that will greatly help you bag coyotes, feral pigs or any other challenging nighttime game. This product is absolutely incredible for the price you pay for it. 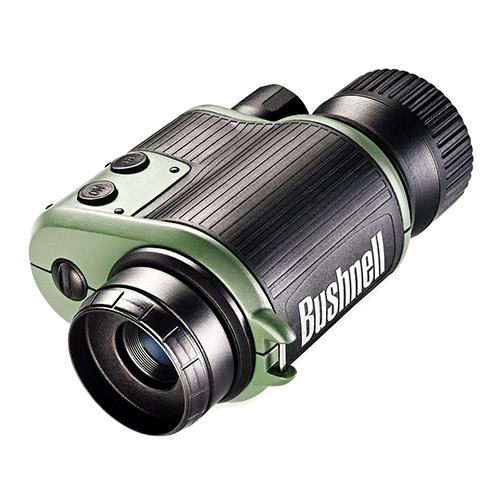 Sure there are less expensive handheld monocular night vision products than this one but why settle for one of those if you can pay a little bit more for an excellent night vision product like this one from Bushnell. 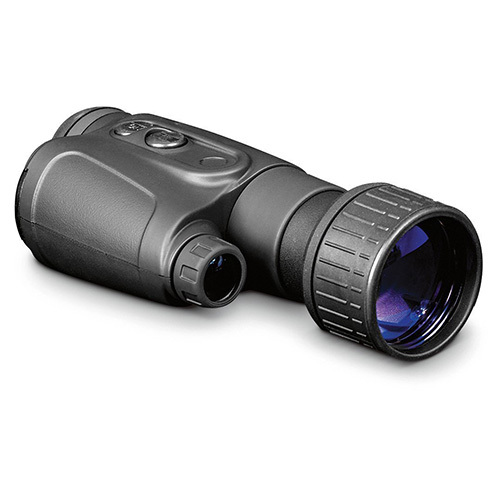 It is a night vision product that is very ergonomically designed for comfortable use in almost any weather conditions. This Bushnell night vision product is also built to last as it helps you scan for game up to 400 feet away from you. It comes with everything you need right in the package and also includes a lanyard so you can carry it securely and a pleather pouch to safely store it in when you are not using it. The infrared technology you get with this device is so good it rivals that of generation 2 and 3 infrared devices but it does so without the high cost of those models. You can also use its enhanced infrared technology to paint a low heat signature object with an infrared beam to get a clear picture of what it is. It also features a smaller size 24mm lens that will allow you to have a very wide field of view which is important when scouting for game at night. When you consider how compact, lightweight and durable this night vision device is you can clearly see it offers the person that uses it a very good all-around night vision experience. 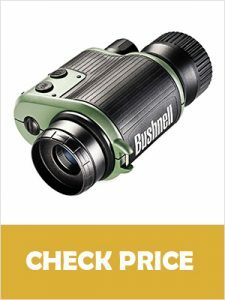 So if you want a great handheld night vision device at an excellent price point, then you can’t go wrong purchasing this excellent model from the reputable manufacturer Bushnell. Why use Night Vision Devices? It has everything to do with being able to scout for your preferred game in the dark and then being able to accurately identify it before taking a shot. Night vision goggles will truly enhance your nighttime hunting experience and help make it much more successful and enjoyable for you. In the area where I live coyotes are becoming a very big problem to say the least. Some nights around my place I hear so many howling so close that I make sure my dogs are inside. I have even been stalked by them on occasion as I headed out early in the morning in pursuit of turkey or deer. They kill way more of the large and small game in the area than they should and they also wreak havoc with domestic pets and other animals such as chickens. That is why it is legal to hunt them at night in my area. Since coyotes are very cunning beasts that only hunt at night, that is when you have to go after them and I believe a good night vision device is essential to the success of this task. A sound pair of night vision goggles will make it much easier to hunt any nuisance predator at night because it enables you to go out into the field or woods and spot them when they are most active. How do Night Vision Devices Work? You might be curious as to just how night vision devices work? Here is a description of how a night vision product produces an image for you to see in the dark. We will describe this as close to Layman’s terms as possible. Available light is collected by your nighttime viewing device. Much of this light is invisible to the human eye. The light passes through the lenses and is multiplied in what is called an intensifier tube. Electrons are then stimulated using the device’s power source and they are then pushed up against the photocathode screen. This screen is located at the front of the intensifier tube. There is another screen located at the back of the intensifier tube called the phosphorescent screen which is also impacted by the moving electrons which causes this screen to illuminate. Together these two screens start top form an image in the nighttime viewing device. The glass optics built into your night vision product will then be used to focus the image the device produces so you can clearly make out what the image is. Despite the fact these devices use infrared technology the image is always shown in what is known as monochrome green. There you go. You now have a better understanding of how a night vision device is able to present to you a clear image of what you are looking at night. 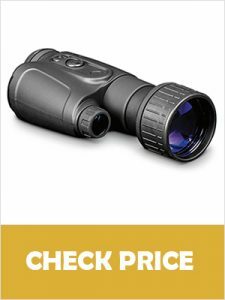 Price is always a great place to start when shopping for any type of item and it’s no different when shopping for a night vision device to help you hunt after dark. It is always a good idea to first set a budget on what you are willing to spend on a night vision product. That way you will not waste time looking at products that do not fall within your chosen budget range. Keep in mind that price is not always reflective of the quality a certain night vision device has. 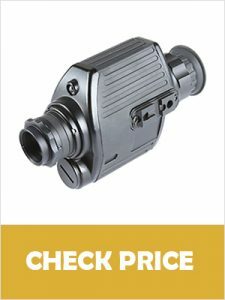 There are some good night vision products out there that can be bought at very reasonable prices. So shop around and compare apples with apples to get the best deal for yourself. Most of the products that use reasonably priced night vision use what is called first generation infrared. These devices will tend to illuminate any object that has its own heat signature such as a person or animal. What sets these devices apart is the way they will illuminate objects that possess little or no heat signature. This is useful for when moving around at night or spotting potential hazards on land or water. This is why you need to look for a night vision device that has advanced IR illumination capabilities. This simply means that you can view even an object with no heat signature if you can shine an enhanced infrared beam from your device on it. A device that is capable of doing this is invaluable during hunting and other nighttime adventures. Lens diameter is directly related to the quality of the image resolution you will receive and the width of your field of view. As a general rule the lower the size of your lens the wider the field of view you will have but the more distortion you will get with the image you receive back. Magnification is stated in terms of the power of the device versus what the naked eye sees. For example: a device that is rated 3X in magnification means you can zoom in on an object three times more closely than what you can see with the human eye. Again with magnification the higher it is the more distortion you will get with your returned image in most cases. Keep in mind that whenever you enhance one visual characteristic of any night vision device you will usually sacrifice something in another area. Here is an example of that: if you use a 20mm lens it will greatly increase the angle of your field of view but you will suffer some in resolution because of what is known as “the fish eye effect”. It goes without saying that when you are outdoors hunting it is not the easiest environment to take equipment into. That is why you need a night vision device that is designed to withstand the rigors that a hunting environment will throw at it. This means you have to look for a night vision product that is built using rubberized materials in its construction to resist scratching and denting. A lot of hunting is also done during adverse weather so you want your night vision device to be water resistant too. Comfort is also a big deal when it comes to night vision product design. If you are looking at buying a wearable night vision device then it must include such things as adjustable straps, chin support and padding where it rests against your forehead. Handheld devices must be easy to grip, ergonomically designed and lightweight. You want to shop for night vision device that gives you the most bang for your buck. That means that you should look for its package contents to include such things as support straps, lanyards, carrying cases and an easy to read owner’s manual. Having such features as being tripod mounting ready are also nice bonuses too. Once again you are reminded that hunting will expose your night vision device to some harsh environmental conditions. Because of that you will want the longest and most comprehensive warranty you can get on any night vision product you will purchase. Make sure you take a good look at the warranty each device you are looking at buying comes with before you make your purchase. There absolutely is no doubt about it; if you want to have a really good nighttime hunting experience you need to have a good night vision device with you. It is paramount in being able to locate and identify any game you want to bring down at night. A good night vision device will also help keep you safe as you enter and exit your hunting area and it will also help you to be sure it is a feral creature you are about to take a shot at as opposed to a person or domestic animal. Do yourself a favor if you hunt at night and make at least a small investment in a quality night vision product. So please consider the advice I give you hear for selecting a proper night vision product that will work well for you. If you do that you will definitely purchase a night vision device that will help you hunt after dark more successfully and more safely.